Hummus is one of those pricey dips found in the deli section. Health foodies have a deep appreciation for chick peas, aka garbanzo beans. It's wonderful to find a snacking dip that not only tastes great, but is actually good for your heart, blood sugar, cholesterol, and colon! I love its savory, creamy, deliciousness!!! But if you're someone, like Will, and you've never tried hummus before, because the thought of actually eating chick peas sounds disgusting . . . I have the perfect recipe for you to try! 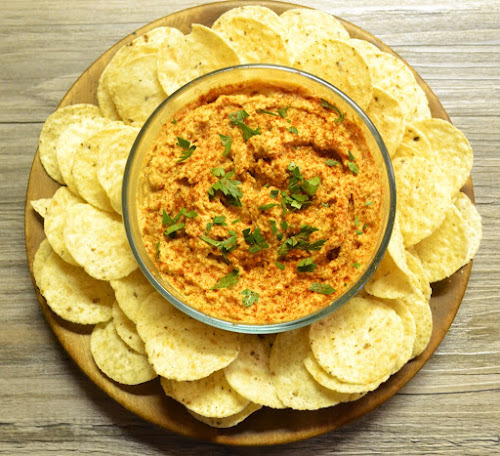 Before I share this recipe, let me preface it by saying, "Will tried my Roasted Red Pepper Hummus to "humor" me, and found he really loved it! It didn't taste grainy, or catch in his throat, like he thought it would! ". You can click on the link below for how to roast your own red bell pepper. I planned ahead and had Will roast mine the day before, while he was already grilling some chicken. It's really easy to do and will save you money! 1 large red pepper, roasted, or 3/4 cup of canned roasted red pepper. Place garbanzo beans, and chopped roasted red pepper in food processor bowl. Optional: Sauté garlic in olive oil on low heat. On a cutting board: add minced garlic and kosher salt; mash with the flat side of a large knife to form a smooth paste. Add garlic to food processor bowl, along with fresh ground pepper, tahini, crushed red pepper flakes, cayenne, cumin, 3 tablespoons lemon juice, 3 tablespoons extra virgin olive oil, and water. Pulse until hummus is smooth; scraping down the sides of bowl with a spatula. Taste, and adjust seasonings by adding more salt, and/or additional lemon juice. Pulse again to incorporate adjustments. For garnish, sprinkle with paprika and freshly chopped parsley. Chill hummus; serve with pita, tortilla chips, or raw veggies. 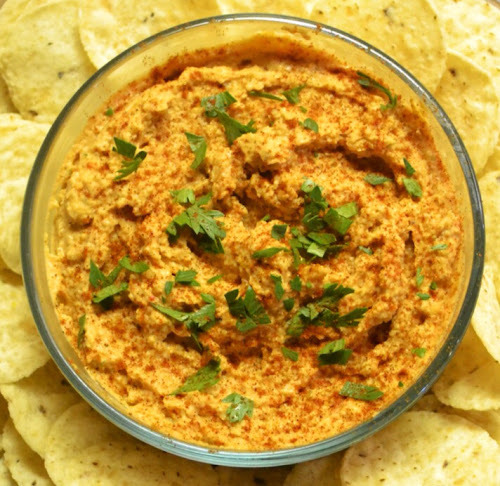 Roasted Red Pepper Hummus . . . A colorful, savory dip to add to your snack food repitoire! The brilliant thing is . . . Shhh! It's actually good for you . . . But don't let them know it! Whip some up for a quick go to, afternoon snack! If you make it . . . they will devour it! At least that's the way it is . . . Over at Julie's!! !